Sullivan township was formed in the year 1816, taken from Covington township. It is situated upon high table lands facing the Tioga valley on the west and the Sugar Creek valley of Bradford county and the upper waters of the Tioga River on the east. Its mean elevation above tide is about 1,600 feet. It embraces some of the best cultivated lands in the county. Its soil is particularly adapted to grazing and the growing of oats, corn, wheat, potatoes and the orchard products. It was named in honor of General John Sullivan of revolutionary fame. Its territory at is formation embraced what is now several townships. At its organization its taxables wee: John Andrews, Isaac Baker, Annais Baker, Simeon Briggs, Simeon Briggs, Jr., Griffin Bailey, Constant Bailey, Thomas R. Corey, Paul Cudworth, James Cudworth, David Crippen, Jacob Collins, Peleg Doud, Josiah Dewey, Joseph Dewey, John Ellis, David Fellows, James Gray, John Gray, Silas Gray, Aaron Gitchell, David Jones, Timothy Knowlton, John King, Uri Loper, Allen Lane, Jr., Lemuel Lane, Allen Lane, John Luddington, William Luddington, Benjamin Lawrence, Henry Lawrence, Asa Mann, Reuben Merritt, Ira Mudge, Eli McNett, John Newell, Jesse Orvis, Joseph Orvis, Timothy Orvis, David Palmer, John Packard, Jonathan Patridge, Stephen Palmer, H. Pitts, Clement Paines, Samuel Reynolds, Enos Rose, Daniel Rose, Jeremiah Rumsey, Noah Rumsey, Smith Rumsey, Thomas Raxford, Elisha Rush, John Simpkins, Gardiner Seaman, Jesse Smith, Jonathan L. Spencer, Lyman Spencer,Benjamin Trout, Nathaniel Welch, Elijah Welch, Nathaniel Welch, Jr., Roswell Webster, Zebedee Woodward, Abiah Webster, Noah Wiest, John Watson, Ephraim S. Marsh, Eli Gitchell, Joseph Ford, Lyman Rumsey, Abijah Hawley, Samuel Harding, Robert Potter, Apolis Cudworth, John Benson, Jr., Daniel James, Levi Fox, Isaac Benson, Thomson Bennett, Benjamin Harrison. County road cut out in 1808 and 1809. The first school house was made of logs. Peleg Doud settled in Sullivan in the year 1808. 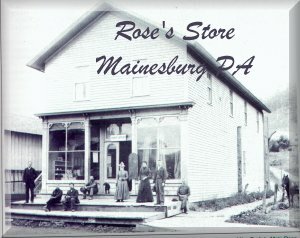 In 1832, John Fox opened a store at Mainesburg. Jeremiah Rumsey settled in Sullivan in the year 1806. John Gray built the first saw-mill in the township in 1811. In 1809, Noah Rumsey erected a flouring mill in Mainesburg. The first Post Office was established in the township in 1814. The fist assessor of Sullivan township was James Gray, Jr. In 1816, John Gray erected and opened a store in Gray’s Valley. John Maine erected a distillery in Mainesburg about the year 1820. Mainesburg Lodge No. 754, I.O.O.F. was organized March 15, 1871. State Road constructed through the township in the years 1807 and 1808. Ira Mudge and William Luddington were the first Supervisors of the township. In the year 1831 flouring mill erected at what is now Chandlersburg, Sullivan township. First religious services held in the township by Rev. Joseph Mitchell about the year 1808. Capt. James Gray, the first settler in Gray’s Valley, Sullivan township, was a revolutionary soldier. William Luddington settled on the county road in 1808. He was one of the wealthiest men in the township. Genial and kind-hearted. There are two churches in Mainesburg. An elegant brick structure owned and occupied by the Methodist Episcopal, and a neat wooden structure owned and occupied by the Christian or Disciples. Mainesburg contains about 200 inhabitants and is surrounded by a good agricultural country. It is situated upon Corey creek, about five miles east of Mansfield and about one and a half miles north of the old state road. 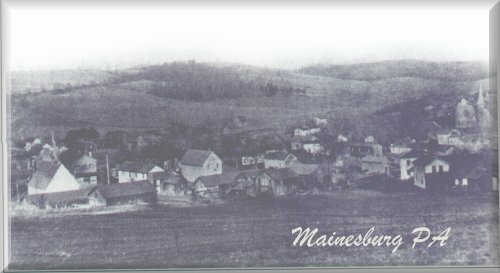 Mainesburg was organized as a borough in March 1859. Taken from Sullivan township. It was named in honor of John Maine, Esq. Its first officers were, Burgess, John Fox; Councilmen, A. C. Witter, E. R. Maine, G. W. Carman, A. B. Austin, P. D. Parkhurst; Treasurer, Alpheus Peters; Street Commissioners; D. S. Peters, G. W. Carman; Collector, James Packard; Clerk of Council, A. C. Witter.